I am wrung out. Completely and totally drained. This was not simply an audiobook; this was an experience. I’ve only had the chance to enjoy Klune’s At First Sight series, so I was woefully unprepared for the emotional wringer that the author put me through. Wolfsong is a fascinating story that spans a decade of Ox’s life as he experiences life, loss, love, death, devastation, and desertion, all while he learns that there’s more to the world than he ever imagined and his role in it is far more important than he could have dreamed. That he truly is special and that the family he makes can be a source of strength he never would have discovered had his father not broken up their family when he was just twelve. And above all that, Ox learned the love is both beautiful and painful, but without it, life isn’t worth living; but with love, life can be worth sacrificing to insure that those in his heart and under his protection will live to see another day. I’m not sure exactly how he did it, but through the words Klune penned and the action that takes place, Graves did a beautiful job of making Ox feel beyond real, larger than life despite his soft-spoken nature. With just the slightest of change in inflection, Graves takes Ox from conversational speech to humor and sarcasm, to love and hope, to despair and devastation, to anger and hurt, and to protectiveness over those who belong to him. Where the narrator of the At First Sight series utilizes an over-the-top performance to make the audiobooks entertaining, Graves is far subtler in his performance of Ox, Joe, Gordo, the Bennetts, and everyone else who makes up Ox’s world – except for maybe Joe when he was a kid, but I don’t consider young Joe to be over-the-top so much as possessing a child’s exuberance that Graves captured that perfectly as well. As you’ve probably guessed, I’m trying not to talk about the specifics on the story too much and that’s because Wolfsong is one of those books that I feel needs to be experienced by the reader or listener without much more detail than is provided in the book’s description. While this is a shifter romance, it is so much more than that, and not just because of the twists that Klune adds, and that’s why I don’t want to talk too much about the details. But if you enjoy paranormal romances that are more than just romance, that are about pack and family, about protecting those who belong to you, about making mistakes and having to live with them, and about healing and love and finding your place in the world, then Wolfsong may be just what you’re looking for – I know it was more than I expected. Despite the fact that my eyes are all red and itchy from crying off and on for the last three days, I wouldn’t change a thing because the emotional rollercoaster ride was epic and awesome. So very worth the price of admission. Well done, Klune, and bravo, Graves. I anxiously await the return to the Bennett pack, whether it be in a sequel or a relisten. This is an exquisite book. I feel unable to summon enough stars or the right words to explain my intense, almost visceral reaction to the story. I wasn’t expecting more than a shifter romance but instead, I found myself enthralled with the voice of an unlikely hero. Poor and not terribly bright, Ox sees the world simply. He fixes cars. He supports his mother. He is picked on at school. But there is a beautiful truth in his simple observations and it is impossible not to love him. Joe is much more complicated. At times, it is difficult to even like the werewolf king in waiting. He is born a leader, and even at a frighteningly young age, he has a disconcerting control over everyone around him. Joe’s character is an unsettling mix of darkness and light, joy and horror. I found him wonderfully compelling even when I started to hate him. Joe and Ox’s romance is long, complicated and, at times, almost unbearable. Joe knows Ox will be his when he is ten years old, but long years waiting are complicated by separation, grief, and difficult battles. I loved all of the characters that interact with Joe and Ox. Their families – both biological and chosen – are wonderful and I loved the distinct identities, the eclectic mix of personalities, and the beautiful, complicated relationships between the people in the two men’s lives. Like all good fantasy writing, there are lessons about love, family and belonging that run deep beneath the surface of this story. It is as much of a story about identity, forgiveness, and integrity as it is a story about warring magical creatures. In many ways, this is a modern heroic epic and I recommend this story to everyone. John & Jackie has been released! Words of warning: you will have total Wookie cry face while reading this book. I regret nothing. When TJ Klune was eight, he picked up a pen and paper and began to write his first story (which turned out to be his own sweeping epic version of the video game Super Metroid—he didn't think the game ended very well and wanted to offer his own take on it. He never heard back from the video game company, much to his chagrin). Now, two decades later, the cast of characters in his head have only gotten louder, wondering why he has to go to work as a claims examiner for an insurance company during the day when he could just stay home and write. He recently went slightly insane and moved to the East Coast from the Sonoran Desert with his fiancé and neurotic cat in tow. He dreams about one day standing at Stonehenge, just so he can say he did. 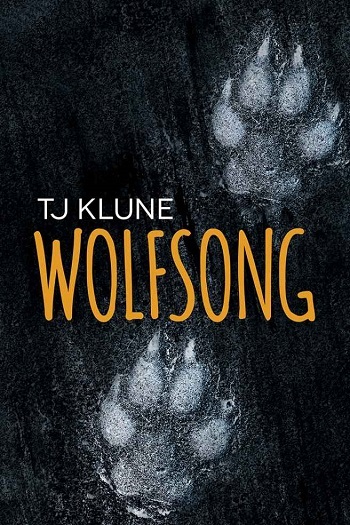 Reviewers on the Wicked Reads Review Team were provided a free copy of Wolfsong (Green Creek #1) by TJ Klune, Narrated by Kirt Graves to read or listen to and review.